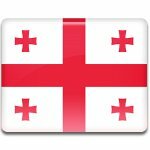 St George is one of the most venerated saints in Georgia, and his feast day, known as St George's Day (or Giorgoba) is a public holiday. It's annually celebrated on November 23. There are many legends about St George. Historians agree, that he really existed, but little faith can be placed in some of stories of him. According to the legends, St George was from Cappadocia, a historical region of Central Anatolia, present-day Turkey. He went to serve in the Roman army and showed himself as a brave and courageous warrior. When he found out, that Emperor Diocletian started persecution of Christians, St George claimed himself to be a Christian. He was imprisoned, tortured and then executed by decapitation on April 23, 303. The feast day of St George in Georgia is credited to St Nino of Cappadocia, who was St George’s relative. The religious festival, that attracts thousands of people, is organized in the old capital and religious center of Georgia, Mtskheta.